Timeline is an excellent addition to Windows 10, introduced as part of the April 2018 Update. It remembers what documents and web pages you’ve been working on recently, allowing you to quickly pick up where you left off. As good as it is, however, it has one major flaw and that’s it only remembers web pages you’ve opened in Microsoft Edge. If you don’t use that browser -- and let’s be honest, that’s most people -- then Timeline’s usefulness is greatly reduced. Thankfully, there’s a way to get it to remember pages you’ve visited in Chrome or Firefox. 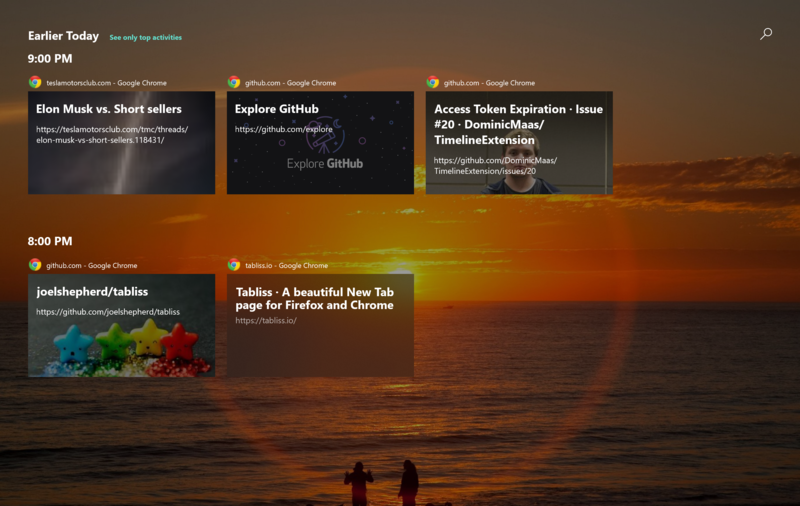 To add your favorite browser to Timeline you just need to install the Windows Timeline Support add-on from the Chrome Web Store, or from Firefox Add-ons. The extension is free, although it is in beta so you might encounter the occasional error with it, but so far it's worked flawlessly for us. Adjust how many seconds you have to be on a page before it's stored in Windows Timeline (by default, 8 seconds). Continue browsing on another device quickly by 'pushing' your current active tab to other devices sharing the same Microsoft Account. You can download the Windows Time Support add-on for Chrome here or for Firefox here.